Synopsis: Since Catelynn Lowell and Tyler Baltierra shared their story of teen pregnancy and adoption on the MTV's 16 and Pregnant and Teen Mom, they've been known for their inspiring commitment to growing up right. Between their experience placing their first daughter for adoption, and their struggle to cope with problems in their families, Catelynn and Tyler were challenged in every imaginable way. But against all odds, the childhood sweethearts rose above the dysfunction to become responsible adults whose story has inspired many others. How did two trouble making kids from the trailer park make it through the storm of family dysfunction, teen pregnancy, and adoption without letting go of each other? What gave them the strength to conquer the chaos of their lives and go on to become people their children could be proud of? And what really happened when the cameras weren't there? 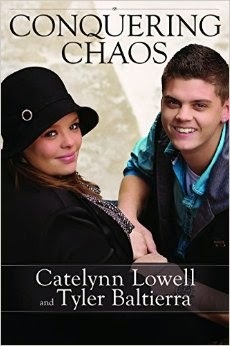 (11)Review: I loved Catelynn and Tyler's very real story of adoption on MTV. It wasn't sugar coated, you saw the pain. the hardship, and the strength it took to place their baby for adoption. This book covers their earlier years and a little of the adoption journey. Tyler definitely doesn't hold any punches and tells things like it is. Their childhood was not all sunshine and roses and their story could have turned out very differently. The pregnancy seems to have been the wake up call they both needed to get their lives on a different path and break the cycle of addiction, teen parenting and dysfunction in their families. With the support of only one parent each and the other set actively fighting against them, they managed to make it through a very difficult decision and seem to have gone on to help others. They give speeches about their struggles and their time on MTV has helped bring new awareness to adoption, the adoption process and how it is not like it was years ago. It also helps to dispel a lot of the myths surrounding adoption and the rosy or sometimes downright nightmarish way adoption can often be portrayed in film and on tv. I liked this book but I wish it had been more. While it gives a good insight and perspective into the lives of birth parents and reasons why they made the decision they did it didn't give me enough about what has gone on since. Yes they finished high school but that's about all I know. I wish it had given me more on how they have pulled themselves out of the situations they were in. Did they go to college? I know they aren't married yet are having an other baby, how long has it been since they placed their daughter for adoption? I also found the book to be a bit repetitive in places. Each chapter has an introduction, the story from both Catelynn and Tylers perspectives and then a conclusion which is just a summary of everything that was just said which could have been eliminated and made the book flow a little better. All in all though I think that this is a good read for anyone who feels they are stuck having to repeat the past or is starting to notice that they are on their way to repeating a cycle in their family that has been passed down for generations. There is hope, there is a way out. It may not be easy, it may not feel comfortable but it can happen.